It is disgusting to watch news and look at the way presstitutes are handling the suicide of a terrorist sympathising anti-national college hooligan just because he belongs to lower caste. 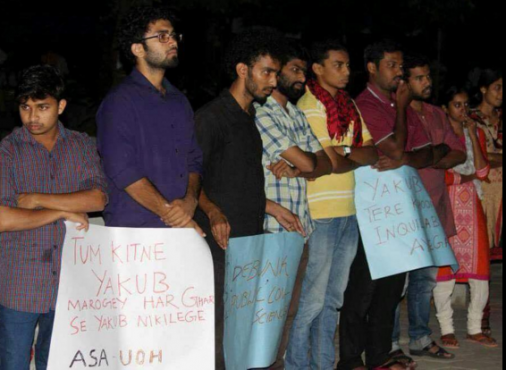 Rohit Vemula and his fellow leftist hooligans had organised a protest inside the campus in support of the terrorist Yakub Menon, who was responsible for bombing more than 200 people in Mumbai terrorist attacks. When some students in his college wrote on Facebook exposing these anti-national students, he and his fellow leftist hooligans beat up those students. The students who were the actual victims of the hooliganism of this guy and his fellow thugs, complained to the college management about this misbehaviour. Taking strict action, the college management then suspended this groups of thugs for goondaism inside college premises. But for obvious reasons the media presstitutes have chosen to completely ignore the sequence of events that led to the suicide of this anti national thug and are now painting a false picture of poor dalit student getting uneven treatment by upper caste university management because telling the truth would not help their anti national agenda. What’s worse is that they are now trying to pin the blame of suicide on the Vice Chancellor of the university, who in all fairness was more than generous in handling this issue. This reasoning is ridiculous but then again did we ever expect sane arguments from the leftist anti-nationals? Firstly, it is difficult to force anyone to commit suicide. Trying to push this narrative that this anti-national thug was forced into suicide by VC is just ridiculous. The only people, who could have vested interest in Rohit’s suicide, are his other fellow suspended comrades or Ambedkar Students Association (ASA), the organization behind the protest in support of Yakub Menon. They are the ones who are now getting cheap publicity by forcing a student commit suicide. This sequence of events is similar to the suicide that was staged in Kejriwal’s rally a year ago. Secondly, the guy in question is not innocent by any means and his punishment was not out of proportion to what he did. In fact, the management was lenient when he was left with just expulsion from hostel instead of expelling him and his fellow hooligans from college outright. Supporting terrorism and indulging in hooliganism is not innocence. Being a dalit does not give leeway to engage in anti-national activities nor does it give him any right to indulge in rowdyism inside college. In fact what the VC did was actually very mild compared to what this anti-national rat deserved- he and his fellow anti nationals should have been expelled from college instead of being expelled just from hostel for beating up other students based on a facebook post. But no, for some reason, his dalit identity is given as an excuse for his anti-national activities and the media presstitutes want us to overlook this misbehaviour. This is unacceptable behaviour from the media as well as the students now engaged in protest. And as usual, all the anti-national politicians from Kejriwal to Rahul Gandhi are ganging up to visit this thugs’ funeral and turn him into some sort of hero. As a society how does it make sense to turn an anti-national rowdy into a hero post suicide? And where were these dalit saving brigade including Rahul Gandhi and Kejriwal when dalit houses and shops were burnt in Malda and dalit Hindus were forced out of their homes? We will go further and say that the students who are currently protesting against the VC for his action against the anti-national like Rohit Vemula are just supporting an anti-national unlawful rowdy masquerading as a student. Such students should be strictly punished, with suspension and expulsion if necessary so that such anti-national politics are not condoned in the future. Our govt. should make it very clear that no one has any right to indulge in any anti-national activity and caste identity does not give a free pass for such behaviour. Any leniency on the students protesting in favour of the anti national rowdy will only set a bad precedent for such anti-national goondaist activities inside the universities and will lead to further worsening of law and order and academic environment in the universities. So the govt. needs to nip this nuisance in its bud. We don’t want all our universities to turn into anti-national factories like JNU. One JNU is more than enough to fulfil our suicidal tendency of supporting anti-national ideologies.